Award winning Jemima Phillips is a harpist with a difference. Often described by her clients as being the highlight of their day and exceeding all expectations, Jemima uses an electro-acoustic harp alongside loop and pedal fx technology to create quirky, unique covers that will have you're guests talking and playing name that tune all day! Her renditions of songs such as Game of Thrones, Sweet Child of Mine, Gangsta’s Paradise are fast becoming her trademark whilst her extensive playlist caters for all tastes. From the first steps down the aisle to the toasts at dinner, you will not be disappointed with her clever blend of romantic acoustic and wow factor electric harp whilst her packages also include creating a varying number of bespoke song arrangements for your special day. Based in the Forest of Dean Gloucestershire, Jemima is recommended wedding supplier at Clearwell Castle, Cripps Stone Barn, Dewsall Court, Cripps Barn and Brisnop Court. With two Royal Weddings under her belt and over a thousand more, she is a highly experienced and sought after wedding supplier! "Thank you for sharing our special day with us and for blowing us all away with your amazing talent! Everyone commented on how great you were and we're so please we found you! Thanks for all your help and guidance leading up to the wedding too - you're such a lovely lady and we'll recommend you to everyone we know!" "The most Amazing Harpist that I have ever heard!!! Totally awesome and a lovely lady with it!" "Awww Jemima, you were simply fantastic!! Everyone loved you!! Thank you again and again for making our day so magical. You are a lovely person and I wish you all the happiness in the world. Merry Christmas 😊🎄🍾💕 X x"
"Wow what an amazing harpist!!! I was blown away when I saw Jemima play!! Looping on a harp!!! Well done Jemima, can't wait to see you in action again!! Highly recommended for any wedding or event!!" "Guns N Roses on a harp.....AMAZING!!!!" 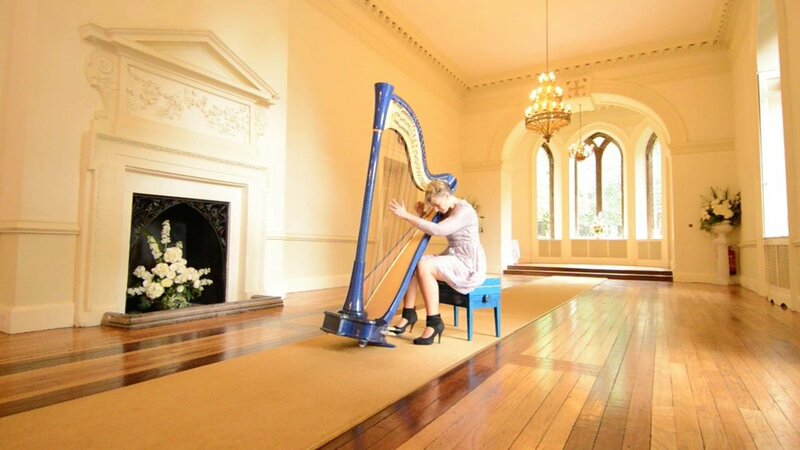 Whether your venue is a church, registry office, hotel, palace, marquee, lighthouse, forest or field, your special occasion will be enriched by the magic of the harp. Jemima has an extensive repertoire but can also arrange requests to tailor make your own personal song choices, suggest ideas if you are stuck or work with you to create your ideal play list to suit any taste. "You were amazing - the Game of Thrones cover was sensational!" ...for being completely amazing at our wedding Jemima - all of our guests are completely raving about you! We couldn't have wished for a more fun, talented, lovely, gifted person to include in our day. Everything from Gangsta's Paradise to Killers to Elbow to Queen of Sheba and more. Fantastic! We hope our paths cross again."